CB Radio was first introduced to the UK in the late 1970's, and unfortunately at first it was illegal. However it became very popular very quickly, so much so in fact that rallies were held up and down the country to try and persuade the government to legalise it. Finally the people got their way and it was legalised in the UK in 1981. Originally there were only 40 FM channels to use, however in 1987 40 more channels were added, the 'European' channels. These are still used in many European countries, but at the time you were not allowed to have all 80 channels in one radio, meaning many people owned two radios to speak on both bands. This changed in 1997 when the government renewed the specification allowing 80 channel radios to be born. In 1999 a new radio system was introduced in the UK called PMR446, which allowed the use of 8 channels (with 38 sub channels) on the UHF band. Use was limited to handheld radios (so it doesn't have the same range capabilities as a CB with an external antenna), however to this day it is still a very handy system for handheld communications up to 2 miles and Thunderpole stock a wide range of PMR446 radios, click here to see them all. 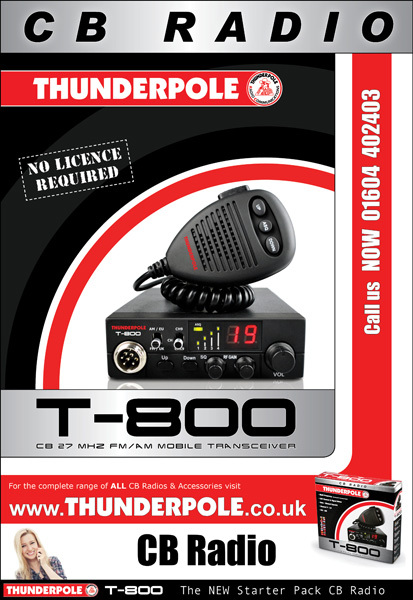 A few years later in 2000 the legislation changed again, and CB radios were allowed to be 'Multi-Channel' which meant they were capable of containing all the different frequency bands used throughout Europe (including AM), and all CB radios sold today by Thunderpole are now multi-channel. 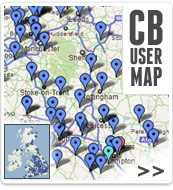 In 2006 the CB licence was abolished in the UK, which has attracted many new (and old!) users to CB radio. 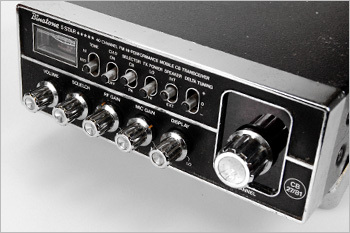 In 2014 the use of AM and SSB was also allowed in the UK, which meant a new wave of radios has been introduced. 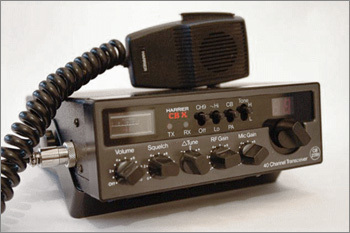 Since the legalisation of CB radio in the UK in 1981 we have seen many different CB radios, and some of you will remember such classics as the York JCB863, Harrier CBX, Midland 4001, Maxcom 30E (Maxon) and some naughtier radios like the Cobra 148 and HyGain V! However did you know that more recently there have been more new CB radios introduced than ever! 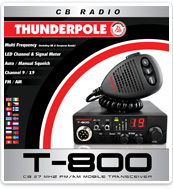 click here to see our complete CB Radio range. 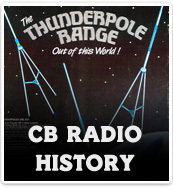 It all started with the Thunderpole I homebase antenna way back in 1982. 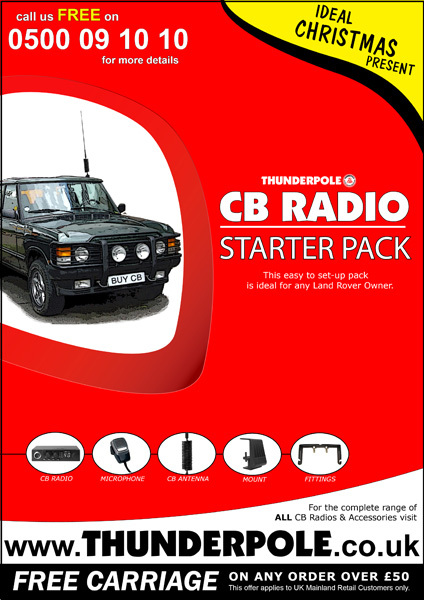 This antenna was very popular, however when the updated Thunderpole II was introduced in 1984 this was a true game changer and many people to this day will remember using this classic antenna, in fact many people still claim it was one of the best CB antennas ever made. 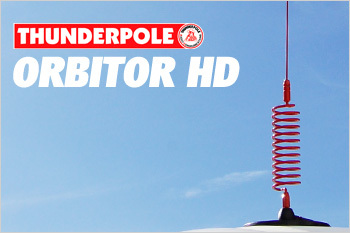 In 1986 came the updated Thunderpole III, and then in 1994 we introduced the best selling mobile CB antenna of all time - the THUNDERPOLE Orbitor. This is still very popular amongst lorry drivers, farmers and off-roaders. 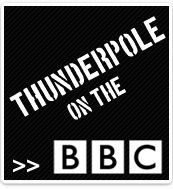 At the turn of the millenium the Thunderpole 2000 antenna was introduced, then the Thunderpole 4 in 2004. Finally in 2010 the Thunderpole 5 was introduced, which was a complete redesign, and has a wide bandwidth of 5 Mhz (with tuning), and this antenna is still going strong today. 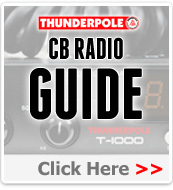 2011 was an exciting year, as we used all our CB radio knowledge built up since 1981 to introduce our first Thunderpole CB radio... the Thunderpole T-1000, and it was an instant hit, outselling all other CB radios in our range! 2014 then saw the launch of the next radio in the range, the Thunderpole T-800, which offers clear reliable communication to everyone. 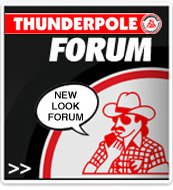 We added the amazing Thunderpole T-2000 to our range in 2015. Now it's 2019 and who knows what the future will bring! 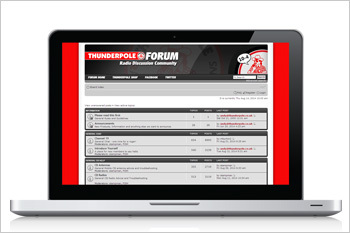 In 2006 we launched the Thunderpole forum, which is a friendly place for people to come and chat with fellow users about CB radio, and find a gigantic amount of information about CB. If anyone has any memories of the early days they would like to share, pictures of rigs/setups, their clubs, maybe some funny stories, we would love to hear from you. We have set up a special 'nostalgia' section on our forum for you. Click here to launch the forum.